Natural gas is an abundant fuel that can help deliver cleaner air and dramatically improve the quality of our environment. It helps to power economic expansion, jobs and a transition away from the higher-impact fuels of the 20th century like coal and oil. Natural gas is a domestically-produced fuel that keeps more of our energy dollars here at home, rather than sending them to unstable parts of the world. At Millennium, we work every day to ensure that our core values stay in focus. In simple terms, our goal as residents of the Northeast, is to contribute to an enhanced quality of life for our friends, family and neighbors through the safe, efficient and environmentally-sound delivery of this 21st-century fuel. Millennium has been delivering natural gas to consumers for nearly a decade. In June 2007 the Federal Energy Regulatory Commission authorized Millennium to commence construction. A year and a half later, that construction was completed and on December 22, 2008, Millennium Pipeline went in service. Anchor shippers were National Grid, ConEd, Central Hudson Gas and Electric and Columbia Gas Transmission. Traditional natural gas markets are expected to grow in the Northeast as efforts increase to improve air quality. 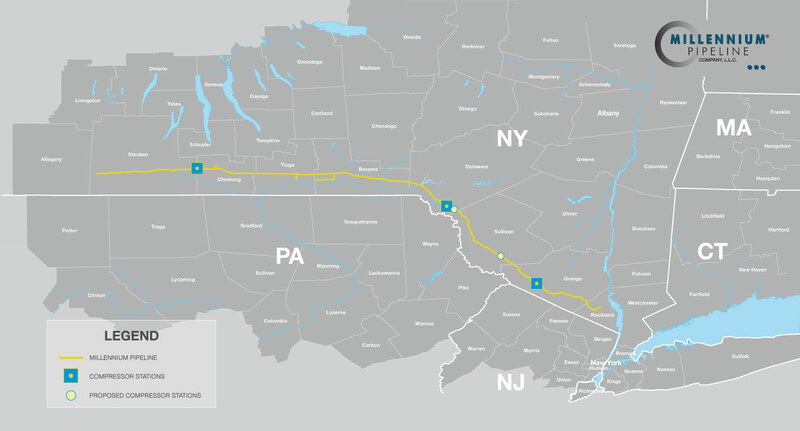 Western New York storage development supports seasonal use of natural gas and discoveries of local gas production including Marcellus Shale gas improve optionality and reliability of natural gas. Millennium Pipeline is well positioned to deliver these benefits to gas consumers. Our goal is for every interaction you have with the Millennium team to be a positive one. Contact us at info@millenniumpipleline.com with any questions or concerns.